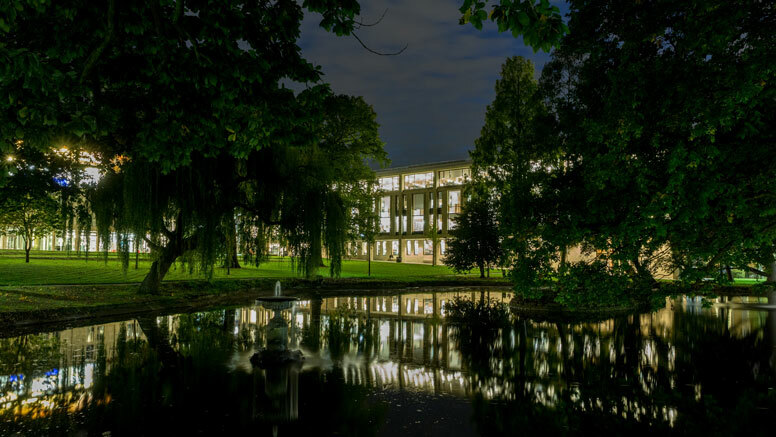 The new university library is the centrepiece of an ambitious campus masterplan, characterised by a generous park and garden landscape. 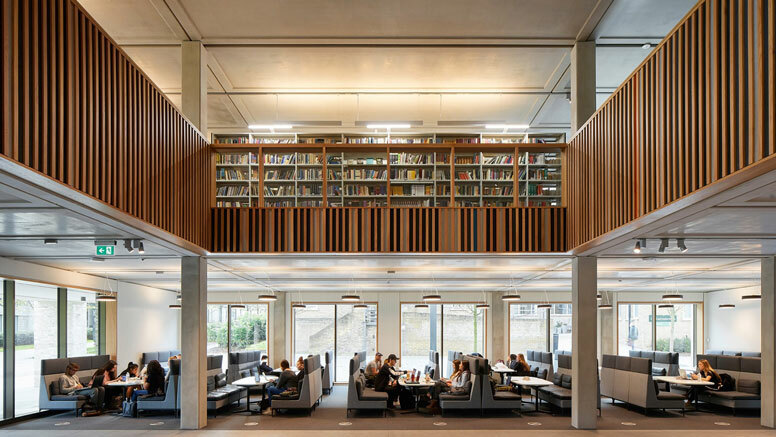 The library provides over 1200 study spaces, open access space for nearly 300,000 print and audio-visual items from the Library’s collections, a dedicated archives and special collections area, social spaces, a café, and staff accommodation over five floors. 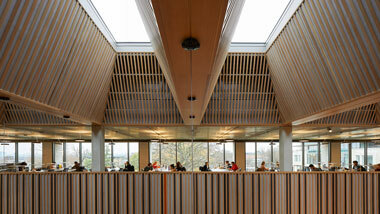 Occupying a long narrow site close to the college lake, the library encloses one side, suggesting a college quadrangle. 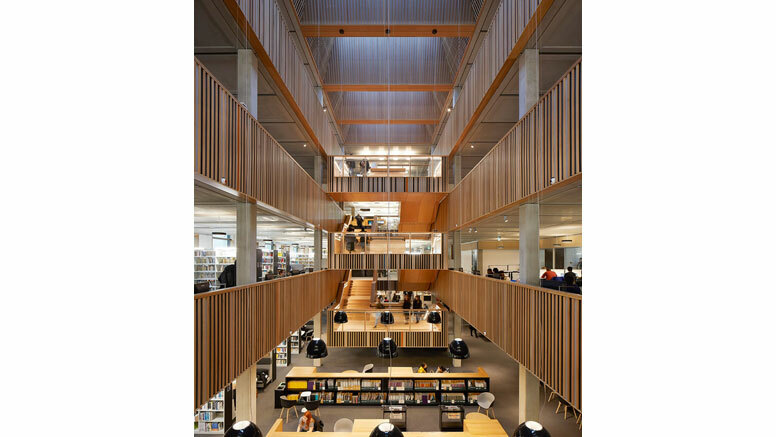 Organised on a rigid construction grid and modelled around a large, light-filled atrium, each floor slightly adjusts its layout with modular volumes and partitions dividing the space according to the functions required. With central circulation extending the length of the building, the spaces are legible and accessible, aided by clear wayfinding and signage. 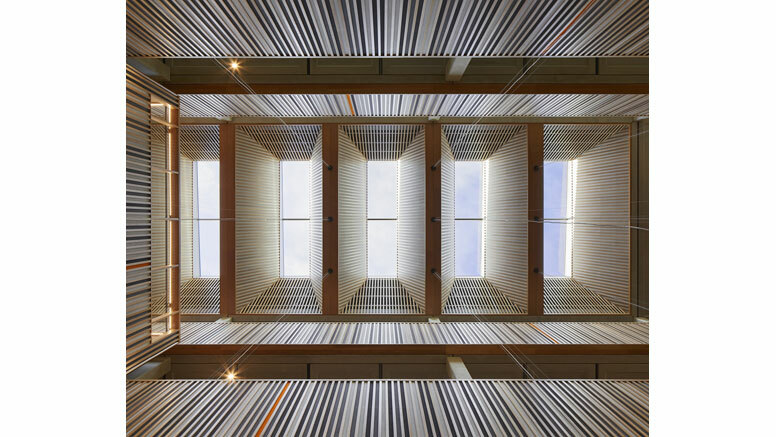 The internal volumes are baffled by felt and timber slatting throughout the library, and lit from above by six large skylights, creating bright spaces without glare. The central staircase provides an ideal spot from which to enjoy the internal architecture. 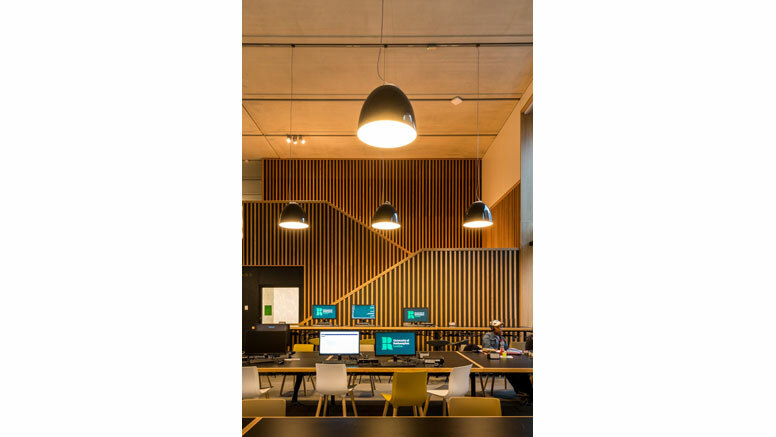 Cafe/refreshment areas, Group study spaces, Open learning provision, Specialist subject collections, Teaching rooms, Exhibition display areas, Meeting rooms, Provision of special materials. The building itself has been described as having a Classical language – including a colonnade facing the landscape and lake, piano nobile floors, and a recessed upper storey. This is continued with a simple palette of high quality masonry and bronzed window treatments. 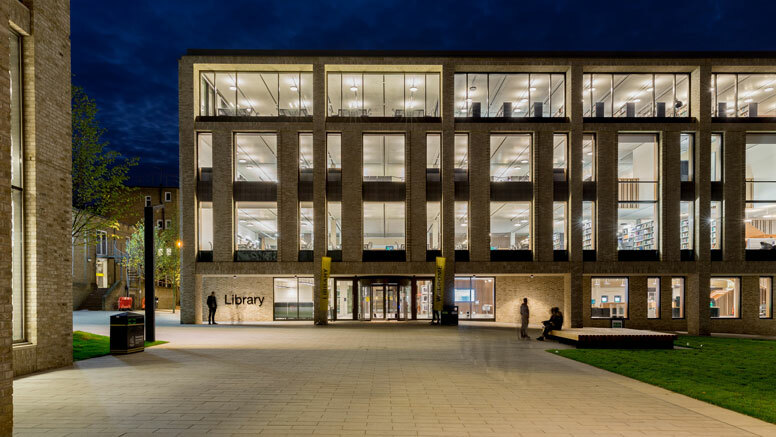 One notable feature is the metal frieze abutting the main façade windows, spelling out the word Library translated into all the World’s written languages. 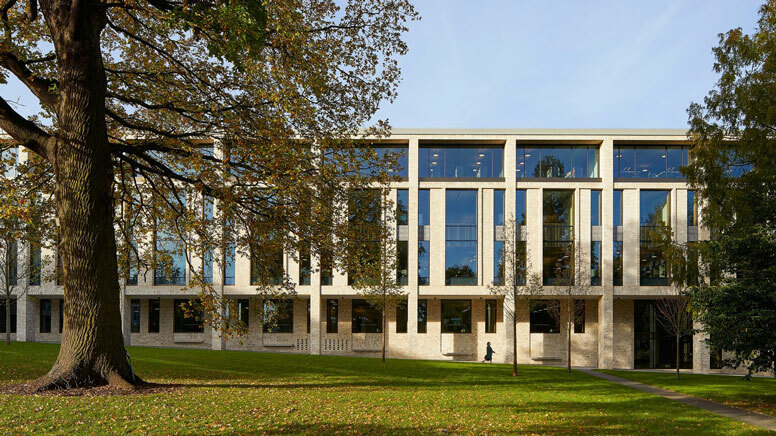 A key part of the project was the extensive use of prefabricated elements to reduced construction time and disruption to the surrounding University. The internal spaces are described by these prefabricated, repeated elements, with fair-faced concrete ceilings and columns, and regularly spaced windows. Staff are accommodated in a large open plan office. 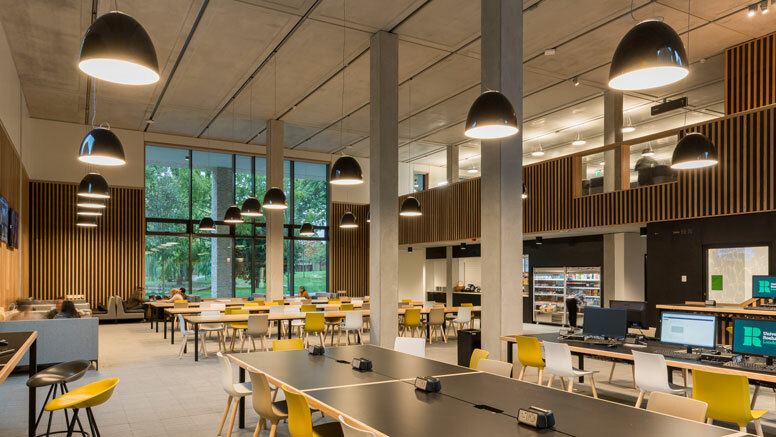 The Library is designed to be a passive building in energy and comfort terms, with highly insulated façades, high levels of airtightness, and roofs supported by a thermally activated building slab (TABS) system installed into the concrete soffits. The building also has a roof-mounted 3.5kW photovoltaic array and connection to a combined heat and power unit that also supplies the neighbouring hall of residence and conference centre.